Jupiter, FL, October 06, 2010 --(PR.com)-- Captiva Spine, Inc., a medical device organization dedicated to developing and distributing spinal technologies in the US and internationally, announced today that it has signed an agreement with Dr. Kamaljit Paul, Oshkosh, WI, to acquire the license to a Cervical Plate System designed and patented by Dr. Paul. 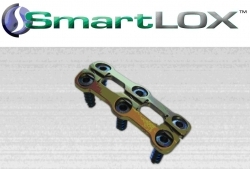 The cervical plate incorporates a proprietary nitinol locking mechanism, that Captiva Spine will market under the trade name, SmartLox™. This FDA cleared device will be introduced during the North American Spine Society meeting held this week in Orlando, October 5-8. The agreement with Dr. Paul, is another example of Captiva’s strength of facilitating collaboration between industry thought leaders, distribution partners, and regulatory engineers, to develop spinal technologies that improve safety, accuracy and ultimate control in the hands of spine surgeons worldwide. According to Dr. Paul, "I am excited to work with Captiva Spine, and look forward to seeing the successful commercialization of this important technology in the U.S."
The organization is rapidly growing its fusion product portfolio in the US and internationally. Earlier this year, Captiva launched its PIVOTEC™ articulating Transforaminal Lumbar Interbody Fusion Cage, which complements the exclusive agreement with Solco Biomedical to import and market the Apollon minimally invasive pedicle screw system in the U.S. Distributor inquiries are welcomed.